The Maryland Department of Natural Resources, in partnership with the Maryland Department of Labor, Licensing and Regulation, is now accepting applications for its workforce development, skills and training program, Work2Live WELL. Now in its second year, this program provides entry into the emerging fields of the environment and natural resources. With funding from the Employment Advancement Right Now Maryland program, this year’s program is recruiting 13 adult applicants in Baltimore City. 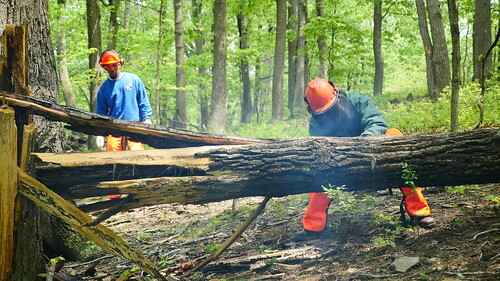 Participants can gain entry, exposure, opportunity and training in blueprints, conservation, construction, dredging, land management, restoration and tree care. The nine-week program offers two distinct tracks, one focused on environmental and land resources, and the other on land and marine construction. Selected individuals will be scheduled five days a week, eight hours a day, receiving classroom instruction, equipment and field training, mentoring, as well as a biweekly stipend. Training will begin in late February with graduation slated for May 2019.